Hedgehog enthusiasts sometimes wonder whether or not a hedgehog actually needs a dust bath. Many hedgehogs have been observed dust bathing in a variety of “dusty” things including spilled chinchilla dust, broken down pelleted litter, and litter in litter pans. Dust bathing is a natural behavior for many types of animals both large (our horse and donkeys) and small (chinchillas and small rodents). These animals use rolling in dust as a way of bathing in a dry environment. While researching this topic more we’ve found a mixed review of opinions both for and against dust bathing. Most hedgehog owners only provide a traditional bath to clean a dirty pet hedgehog but in addition to the fun of a dust bath there may be some benefits. 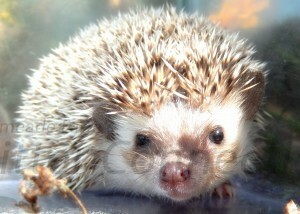 HedgeMom posted on Hedgehog Central that she has many hedgehogs that seek out and play in spilled chinchilla dust. There are some possible risks associated with dust baths, which include males getting dust in their genital area. As with every play activity it is always wise to keep an eye out for any problem. On occasion new hedgehog owners are surprised to find that their hedgehog prefers to dust bathe in their litter pan instead of using it for its intended purpose! Some hedgehogs love to dig and fling in sand to look for hidden treats. After all, this is a completely natural thing for your hedgehog to do in the wild. Reptile sand is a popular substrate as it is used for animals that frequently ingest their bedding while eating. One must be cautious when using commercial grade or beach sand that can harbor fleas and bacteria.